Create a memory jar with things collected while celebrating your wedding. 1. 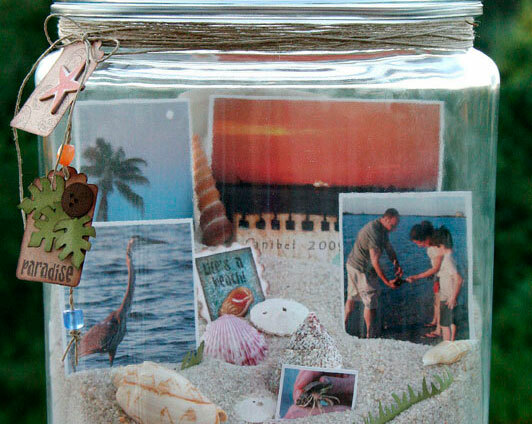 For this beach memory jar, the artist started by filling the jar about 1/3 of the way with sand. also tipped the jar to create an angled landscape that would make it easier to see all the elements inside the jar. 2. The artist printed several photos 3 x 5 inches, wallet sized and contact sized and inserted them into the sand. 3. Then added a variety of shells. 4. They also used Border Punched Grass and a stamp using the Postage Stamp Border Punch to further embellish the scene. 5. Twine was wrapped around the top of the jar and created tags using stamp designs. 6. Once everything is set, put the lid on your jar and enjoy! This entry was posted in DIY, Etc, Uncategorized and tagged Destination Wedding Ideas, Destination Wedding Memories, Destination Wedding Memory Jar, Destination Wedding Momentos, DIY Destination Wedding Crafts, Remembering your destination wedding. Bookmark the permalink.